A new study has found that trajectory analysis improves the consistency of land cover mapping time series, and thereby achieves better consistency in water balance estimates. The research was conducted by a team of scientists from Australia and Belgium, using the Flanders-Brussels region in Belgium as a case study. The team showed that an example distributed water balance model estimated that the inconsistencies in the maps introduced uncertainty in groundwater recharge of up to 30%, most of which can be resolved by the suggested trajectory analysis. Therefore, the study highlights the role of consistencies of land use map time-series for assessing land use change and its environmental impact. The paper, published in Journal of Hydrology, presents the first-ever research that uses full spatiotemporal trajectories to correct the overestimation errors and interpretation inconsistencies in existing land cover maps from the CORINE data set in relation to assessing the impact of land use and land cover change on groundwater systems. “Due to their availability and relative uniformity over the entire European territory, CORINE land cover maps are often used for land cover change analysis and identification of impact(s) on the environment,” says co-author Professor Okke Batelaan of Flinders University. The researchers used a methodology that consisted of two parts. The first part contained two steps. 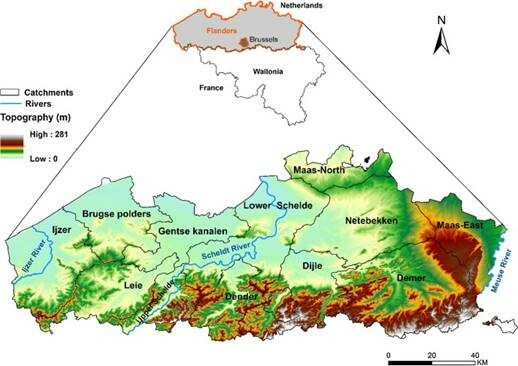 Firstly the change trajectory analysis was performed for the CORINE land cover maps for Flanders for three years (1999, 2000, 2006) and the most recent and detailed land use reference map of Flanders for 2013. Secondly, the CORINE land cover maps were corrected according to pre-defined rational change rules. The corrected land cover maps were integrated into the spatially distributed hydrological model WetSpass to calculate the seasonal and annual evapotranspiration, surface runoff and groundwater recharge. According to professor Batelaan, the research has important implications for hydrogeological prediction and water resource management and will inform future modelling experiments to improve the accuracy of land use maps and time series.